The European Patent Office recently announced that 2014 was a record year for patenting activity in the Netherlands. Compared to 2013, the number of patent applications originating from Dutch companies, institutions and inventors grew by over 9%, with health technology and lighting giant Philips leading the pact by filing over 2,300 patent applications. Other notable Dutch companies with significant patenting activity include Unilever, DSM, Shell, NXP and ASML, each responsible for a large portion of the over 8,000 patents filed last year. In how far is all this innovative activity connected? Which companies operate in the same space, and which technologies connect seemingly unrelated technology clusters to each other? Let’s construct a patent network to get a view on this. 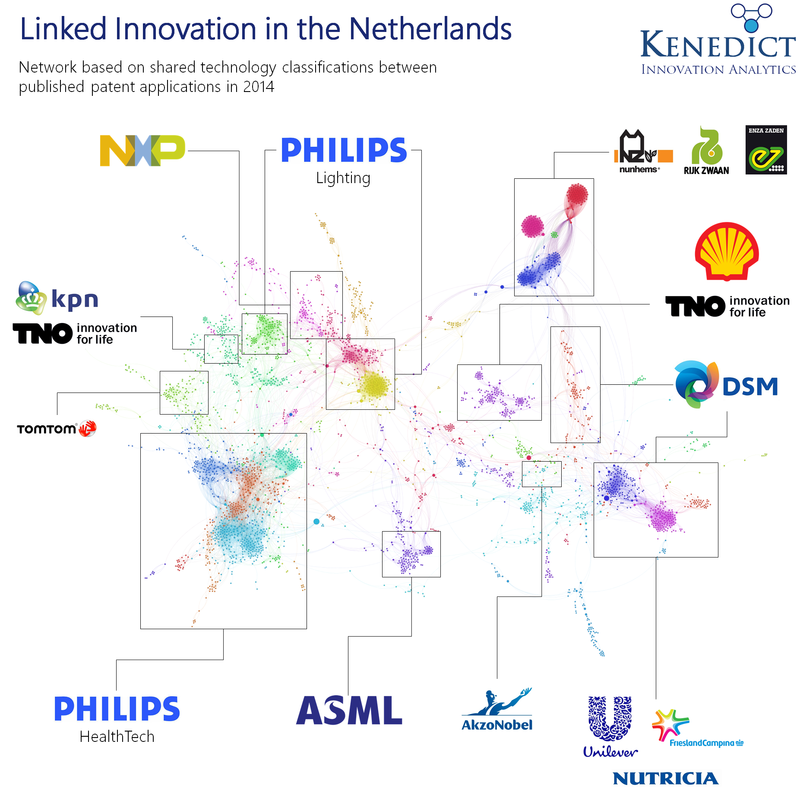 A graphic showing the connectedness between Dutch patent applicants based on technology similarity. The left part of the network is mainly focused on medical technology, communication and high-tech, while the right part consists of foods, agriculture, life sciences, pharmaceuticals and energy technology. The above graphic is based on all published patent applications by Dutch applicants in 2014. To focus on unique technologies and avoid cluttering of the networks, the patent data was filtered to only include patents representing so-called patent families (multiple patent applications in various countries relating to the same invention). Because of the focus on the Dutch patent landscape, non-Dutch organizations which use Dutch legal entities to host their patents (such as oilfield services company Schlumberger or hard drive manufacturer HGST) were omitted. Networks were then constructed with nodes representing patents and connections between patents based on shared CPC (Cooperative Patent Classification, a system used by worldwide patent offices to classify patents) codes. The final dataset includes 5,895 published patent applications – the network presented here details the largest interconnected technology cluster, comprising 3,561 patents. The graphic above clearly shows Philips’ leading position in terms of its number of published patent applications through the sheer size of its technology clusters. The company’s recently announced split in separate HealthTech and Lighting entities is also clearly notable here, with a significant amount of patent applications published in each area. Surrounding Philips’ clusters we see various groups of technology related to high-tech and communications, including Eindhoven-based semiconductor company NXP and leading lithography systems manufacturer ASML, as well as various companies focused on communication technology. The right-hand side of the network focuses on foods, chemicals, pharmaceuticals, agriculture, life sciences and oil and gas, with DSM (the number 2 in terms of patent filings in 2014, according to the EPO) occupying an important position in linking together a multitude of technology clusters. What’s very interesting to see is that all the technology clusters and the companies responsible for them are connected in some or the other way. For some clusters, like the Unilever/FrieslandCampina/Nutricia cluster at the right, this is quite logical since they all operate in a similar space from a technology point of view. Other relationships are less clear-cut, but still there: Philips Lighting is clearly connected to agricultural innovation, while DSM plays a key role in connecting foods, chemicals, agriculture and biomass technology. Of course, this is just the tip of the iceberg. An approach such as the above also allows the mapping of the evolution of country technology networks over the years. This has the potential to answer many interesting questions: how have technology areas merged over time? In how far has a country’s governmental R&D policy been effective in stimulating patent activity? Which technologies have emerged and disappeared over time, and how are these linked to other technology areas? How do countries’ technology positions differ based on the inherent structure of their patent networks? From a competitive intelligence perspective, organisations can use similar analyses to get a data-driven overview of which companies operate in a similar technology landscape, or to find out how cross-over technologies have contributed to bringing together seemlingly disparate technology clusters. This can be of great aid in the idea phase of innovation, and can provide key information on potential ‘white space’ on which a company could focus its R&D activities in the future. This analysis was supported by SURFSara, the Dutch national High Performance Computing and E-Science support center, who generously offered to use its High Performance Cloud Computing environment for the analysis.